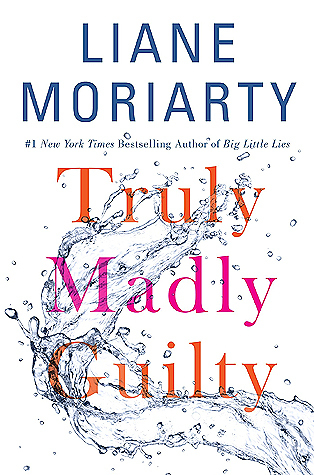 Review ~ Truly Madly Guilty, by Liane Moriarty. I was first introduced to Liane Moriarty when I read Big Little Lies (Big Little Lies – review) and I now consider myself a big fan. So, it was no surprise that I also loved her newest work, Truly Madly Guilty. This novel is a bit of departure from her previous novel; yes, there is still the same format – a buildup to a big reveal – but, this time, the reveal isn’t a “who’s the killer, what’s the secret” type of deal. Mortiarty’s latest novel take a more nuanced, emotional approach to unwrapping the story and revealing what happened. As with previous books by Moriarty, character development is key to the story. Moriarty manages to present realistic, fleshed-out characters that pull the story along without the need for flashy incidents of disingenuous shocks. Indeed, the shocks in this novel are real; they happen to everyday people, and even though they may seem tame in comparison to traditional thriller writers, they really hit home due to the genuine portrayal of the characters. A cathartic, emotional roller coaster, Truly Madly Guilty, will pull you into the world of seemingly normal suburuban characters, who go through abnormal circumstances. You may cry, you may laugh, and you may well find yourself with cold food/drinks as you read “one more chapter”, but most of all, you will be glad that you once again joined the journey of superb characters written by Liane Moriarty.